Who says small and compact has to be boring and unexciting? When you are owned by Mercedes-Benz, it will be anything but boring. The new 2014 smart fortwo BoConcept edition is a special edition that gets new upscale treatments. And the design influences inside come directly from BoConcept, the Danish urban interior design specialist. Who better to design a complete smart interior than a design specialist who does exclusive finishes found within the most sought-after properties in Europe? Leave it up to Mercedes-Benz to collaborate with an exclusive home interior design expert to take the smart fortwo to a whole new level. What will we be seeing next, hot stone massage like there is in the new 2014 S-Class? It may not be that luxurious in the new smart fortwo BoConcept edition, but it does come with the latest home interior trends, such as matt surfaces, distinctive colors and bold material combinations. And it doesn’t just happen on the inside. The limited edition model also features matt crystal white body panels and is further enhanced by distinctive light lemon mirror caps and accents on the 15-inch nine-spoke alloy wheels. Those who see it on the street will notice BoConcept logos in the mirror triangles to set it apart from any other smart fortwo. But step inside and you’ll feel like you’ve been transported to another dimension. There are unique tobacco brown leather-look seats teamed grey quilted fabric inlays and light lemon double stitching. This unique design is synonymous with BoConcept style. The dashboard, door panels and kneepad also get the special treatments and color scheme. The interior is further complimented by a two-spoke leather steering wheel also with matching light lemon double stitching. 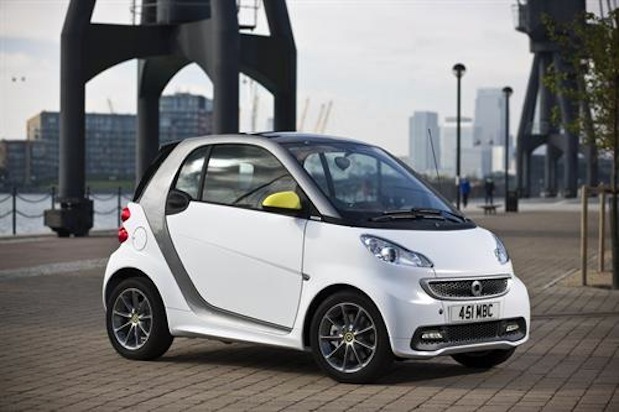 The newest special edition smart fortwo is available either coupe or cabrio body styles. It comes loaded with high-tech goodies like highline multimedia and navigation system with 6.5-inch touch-screen, Bluetooth, iPod interface and CD/DVD player all as standard features. Leave it up to Mercedes-Benz to raise the bar to a new level never seen before in the small compact segment. The all-new 2014 smart fortwo BoConcep is available to order now in Europe and is priced from 11,940 euros for the coupe and from 13,440 euros for the cabrio model.